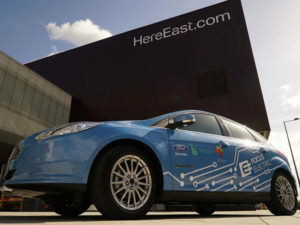 Ford’s Smart Mobility Innovation Office will be sited within the Here East technology hub on the former Olympic Games site in Stratford. Ford is to open a Smart Mobility Innovation Office in East London that will develop future mobility solutions specifically for Europe. Located within the Here East technology hub on the former Olympic Games site in Stratford, the office will open later this year and is based close to the carmaker’s existing trials in London including the plug-in hybrid Transit fleet project that also launches this year. Ford add that the Olympic Park’s private road network may also be utilised for testing in the future. 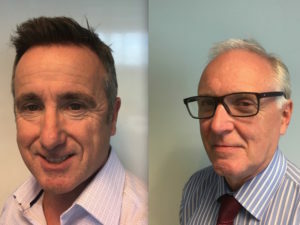 (L-R) Des Morrison and Dr Nigel Pratten join DriveTech. DriveTech has announced plans to grow its presence in the driver awareness scheme sector under the appointment of Des Morrison. Morrison joins the company as head of police contracts and will lead DriveTech’s strategy in the driver offender retraining market as well as manage the day-to-day police operations team. The appointment will draw on his experience of growing business in the police sector including working at TTC Group, where he was operations director and managing director for several years. In addition, Dr Nigel Pratten, who has worked with DriveTech over several years on various developmental projects, will take up a new role as Head of product solutions and training. (L-R) technical and business development manager Nathan Brooks and technical services advisor Andrew Partis. 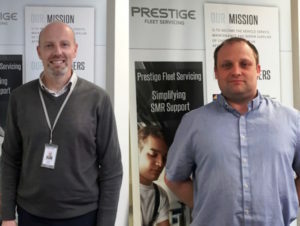 Prestige Fleet Servicing has made two new key appointments to its technical and business development support teams. Nathan Brooks has joined the business in the newly created position of technical and business development manager, having previously worked for the AA Inspections Team, after initially starting with the AA as a patrolman. Andrew Partis has joined the company as technical services advisor, having previously worked for 15 years with LeasePlan, and will work on new products and services for fleet customers. 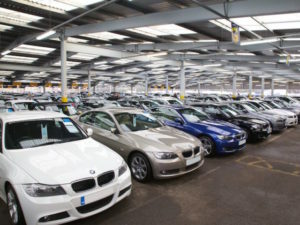 May saw a 14.4% year-on-year increase in sold volumes for diesel cars in Manheim’s auctions, accompanied by a 7% rise in average selling price. Demand for used diesels increased in May, with latest Manheim figures also showing rising average and ex-fleet auction values. The auction specialist reported a 14.4% year-on-year increase in sold volumes for diesel cars in its auctions, accompanied by a 7% rise in average selling price. For petrol cars, there was an 8.5% increase in sold volumes, while average selling prices climbed more steeply by 15.1% year-on-year. Average selling price for used cars reached £5,904, up 10.9% increase from May 2016, with Manheim attributing this to a shift in stock profile, with a higher proportion of higher value, ex-fleet cars sold in May. Sold volumes were up by 11.3%, and the average mileage of cars sold by Manheim fell once again, this time by 7.3% to 60,245 miles. In the ex-fleet sector, the average selling price rose by 4.5% year-on-year to £9,624 following the slight decrease seen for ex-fleet values in April. Sold volumes increased by over a third year-on-year, and by over a quarter from April.